A fresh look at data from a 1997 flyby of Jupiter's moon, Europa, suggests that NASA's Galileo spacecraft flew directly through a watery plume, raising hopes of probing the jets for signs of life around the second planet from Earth. The revelations Monday came after scientists revisited a puzzling reading from an instrument aboard Galileo, which in 1995 became the first spacecraft to enter the orbit of a gas giant planet. 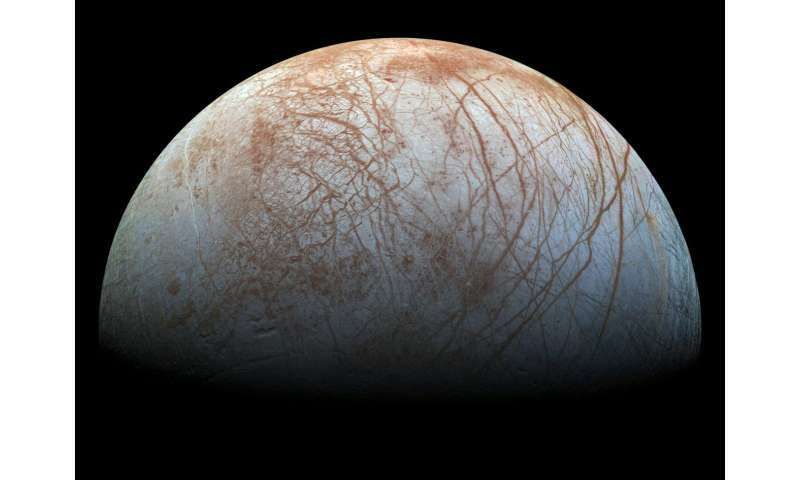 What they found was the most direct evidence yet of plumes emerging from Europa's frozen surface, researchers reported in the scientific journal Nature Astronomy. Europa has long been thought to cover a salty ocean about twice the size of our planet's. Given the suspected abundance of warm, liquid water under its thick ice shell, the moon is considered a "top candidate" by NASA for life on a solar system body other than Earth. In the last several years, NASA's Hubble Space Telescope has detected evidence of plumes on Europa, but from afar. Galileo came much closer during its 11 flybys of Europa. "On one particular pass by Europa, the spacecraft came very, very close to the surface—as I remember less than 150 kilometers (93 miles) above the surface—and it was on that pass that we saw signatures that we never really understood," said Margaret Kivelson, professor emerita of space physics at the University of California, Los Angeles, on NASA TV. That region was in an area where the Hubble Space Telescope had spotted repeated evidence of plumes. When another researcher presented findings recently on Hubble's collection of observations, "that led us to realize we had to go back and look at Galileo data," said Xianzhe Jia, associate professor at the University of Michigan, Ann Arbor. For the new study, experts measured variations in the moon's magnetic field and plasma waves, based on data obtained during Galileo's close flyby, and found they were "consistent" with the spacecraft crossing a plume. "These results provide strong independent evidence of the presence of plumes at Europa," they wrote in Nature. NASA reported evidence twice before, from its Hubble Space Telescope, of the existence of water plumes on Europa, though this interpretation has caused much debate. And many questions remain about what is contained in the plumes, and whether that includes some form of life. Elizabeth Turtle, research scientist at Johns Hopkins Applied Physics Laboratory in Laurel, Maryland, said the subsurface ocean "is likely the most habitable part of Europa because it is warmer and it is protected from the radiation environment by the ice shell." And if plumes erupt like geysers, "there may be ways for that material from the ocean to come out above that ice shell and that means we would be able to sample it," she said. The report was described by NASA as "good news" for its unmanned Europa Clipper mission, an $8 billion endeavor on track to launch as early as June 2022 and plans a series of low-altitude flybys of Europa when it could sample the frozen liquid and dust particles. "There now seem to be too many lines of evidence to dismiss plumes at Europa," said Robert Pappalardo, Europa Clipper project scientist at NASA's Jet Propulsion Laboratory in Pasadena, California. "If plumes exist, and we can directly sample what's coming from the interior of Europa, then we can more easily get at whether Europa has the ingredients for life," he said in a statement. "That's what the mission is after. That's the big picture." Galileo launched in 1989 to examine the fifth planet from the Sun. Before ending its mission in 2003 with a planned crash into Jupiter's atmosphere, Galileo reported the first data suggesting a liquid water ocean under Europa's surface. Seeing as fish left the sea and crawled on land turning their fins into feet, if like Europa sea is covered in ice, instead of atmosphere covering the Earth's sea instead was covered in ice the same as Europa, would fish have evolved in the sea as they have now. If this is the case when Europa's ice melts Europa's fish will crawl on land turning their fins into feet. Lol. And the evidence for this idiocy is.....? Zero, as usual. Just more idiotic Velikovskian lunacy, based on precisely nothing scientific. jonesdumb obviously didn't read the paper, it's all there with the proper interpretation of the data. Really? Then spell out where the data says that this is electrical woo, rather than H2O. Feel free to quote from the paper. Feel free to quote from the paper. "During this flyby, which dropped below 400 km altitude, the magnetometer recorded an approximately 1,000-kilometre-scale field rotation and a decrease of over 200 nT in field magnitude, and the Plasma Wave Spectrometer registered intense localized wave emissions"
Hmmm, a rotating field with localized intense wave emissions. "The sudden, short-duration jump in the frequency of intense emissions can be interpreted as consistent with a highly localized source of plasma,"
"In the electric field spectra (Fig. 2a), a narrow-banded enhancement of power evident through the entire pass is interpreted as the upper hybrid resonance (UHR) emissions." There is more, but I have to go now. ^^^^^^All of which says zero about a current, you dolt. They were looking at this data because Hubble had seen plumes from the moon. So they looked at the Galileo data, and ran a simulation of what should happen were the spacecraft to have actually flown through an H2O plume. Guess what? The data well matches the sims. They modelled no current. Why would they? Hubble had detected H-Lyman alpha, and OI signatures. Those are neutrals, for the hard of thinking, and are diagnostic of H2O. There also appears to be a correlation between plume intensity and the moon's orbital position. At pericentre (closest to Jupiter) it is lower. At apocentre (furthest) it is higher. This is consistent with tidal stress being the cause, as is also seen at Enceladus. So, sorry, no electric woo. The paper is freely downloadable if you sign up for a free account at Science/AAAS. All of which says zero about a current, you dolt. Right, because the rotating magnetic field is there by magic. The data well matches the sims. With a shoehorn, likely why it took a decade or whatever to match it. They modelled no current. Why would they? They are plasma ignoramuses, your question is appropriate. And they are mistaken for not doing so, that's why you guys are magicians and not scientists. ^^^^^^^More word salad, no science. They see a plume. They see the signatures of water. They model what would happen. Everything says water plume, nothing says current. End of story. Who has done the modelling for an electric current? Where is this current coming from? Nobody has done so, because it isn't an option, and no plasma physicist would believe that it is. The only ignoramuses are the EU loons, who don't have a single plasma physicist within their ranks. Hence why they don't understand it, and can't model it. jonesdumb gets flummoxed when anything electric is mentioned, he obviously missed the electric field measurements and the fact the rotating and changing magnetic fields require the electric currents per Maxwell's equations and almost 200-years of experiments and confirmation by EE's. Who puts on yours pants and wipes your chin jonesdumb? Flow diversion around an obstacle twists the magnetic field. The rapid changes in By near the centre of the plume, where the y-component of the field abruptly turns positive (125 nT) and then negative (−219 nT), result from flow diversion around a plume. So, when are we going to see the EU model? For anything? Lol. Now jonesdumb is getting agitated and resorting to, vulgarities, name calling and childish commentary. Pop one of your dementia pills jonesdumb, you're starting to lose it. BTW, jonesdumb quotes the paper where they discuss a "flow" of plasma which indicates a current. But who cares about facts? LOL! Jesus, how thick can you be? A flow of plasma equals a current? Dear me. So, tell me dumbo, what is the measured current of the solar wind? Get an education, you loon, before you try to criticise real scientists. You just make yourself look stupid every time. No wonder you fell for the EU fairy tales. Hey, I just thought of something - why don't the EU wooists make themselves a shed load of cash by patenting an invention which comes about as part of their 'theories'? Forget ion drives; forget solar sails; forget chemical; the solar wind is a bunch of moving plasma. According to the EU woosters, that = current! All we have to do is collect that current, and use it to power our spacecraft for as far as they want to go. We could be at Proxima B in no time. "Natural observable examples of electrical current include lightning, static electric discharge, and the solar wind, the source of the polar auroras." Hmmm, the solar wind as an electric current. I saw a presentation on Europa by a Principal Investigator from the Galileo mission around 1996 or so and he discussed the cracks in the ice on Europa and the possibility that this passage through a plume from Europa had occurred, though he was quite guarded and told everyone that the evidence was equivocated and it might not have been a plume. Looks like in the end, he and his team were vindicated. Oh dear, looks like your knowledge of such matters is as limited as Don Scott's. And his is abysmal. The current is induced due to the interaction of the solar wind with the Earth's magnetosphere. There is no current in the solar wind itself. The current is induced due to the interaction of the solar wind with the Earth's magnetosphere. There is no current in the solar wind itself. LOL, jonesdumb still believes Sidney Chapman's theory of the aurora is still the correct theory. Here we are 50 years after Birkeland's theory was proven correct but jonesdumb is still stuck in pre-space-age beliefs. It's already been pointed out to jonesdumb that the Earth is directly connected to the Sun via "magnetic flux ropes" (more appropriately Birkeland currents) which trace back to the Sun. The flux tubes are electric Birkeland currents, jonesdumb is stuck in out-of-date 19th-century beliefs. The solar wind is protons and electrons ejected from the Sun by its temperature and its magnetic fields. Obviously da schnied didn't read the links I included as it is obvious heat and magnetic fields cannot explain the observed spaghetti like structures in the solar wind. What's also amusing is how jonesdumb conveniently disappears when the actual details of the solar wind are pointed out. They very likely are observing a type of flux transfer event similar to the observed event between the Sun and Earth. Since there is no atmosphere the Birkeland current imparts its energy to Europa's surface causing electric discharge erosion that liberates material and enables electrochemistry to create the detected materials. No hidden ocean is necessary.